A: They both spent their childhoods as herd boys. 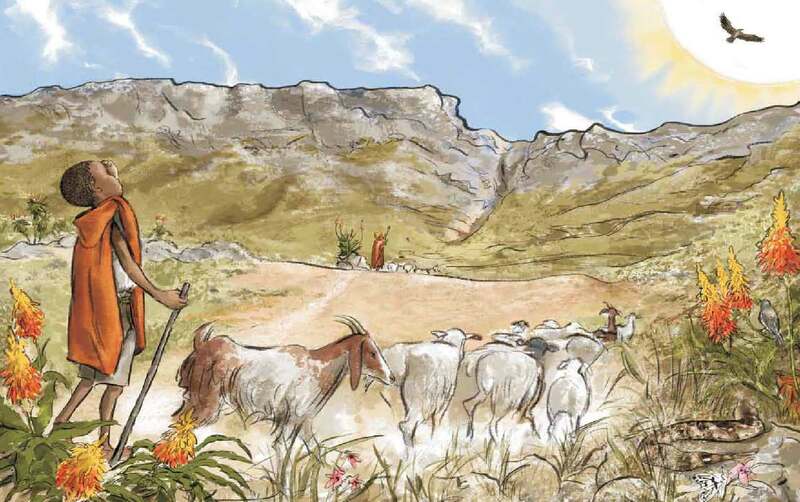 In Niki Daly’s picture book The Herd Boy, young Malusi is a herd boy, too, tending his grandfather’s herd of sheep and goats in the dust and sun of South Africa. 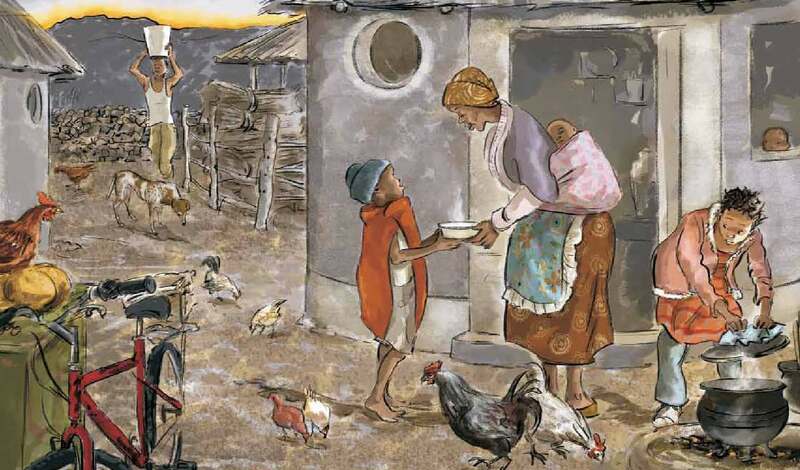 Malusi begins his day at home in the early morning with a bowl of melie pap (maize porridge). After breakfast, he drives the sheep and goats out of the kraal to the grazing slopes. Malusi and his friend Lugisa pass the time stick-fighting and playing football (soccer), though Malusi also enjoys “being on his own — just him and his shadow.” He watches the termites (“such hard workers”) and the dung beetle (“who never gives up”). The boys’ day isn’t all games and dreams. It is a serious responsibility to be a herd boy, one that includes keeping the animals away from the treacherous ravines, or dongas, and defending them from the fierce baboons that haunt the edges of nearly every frame of the story. 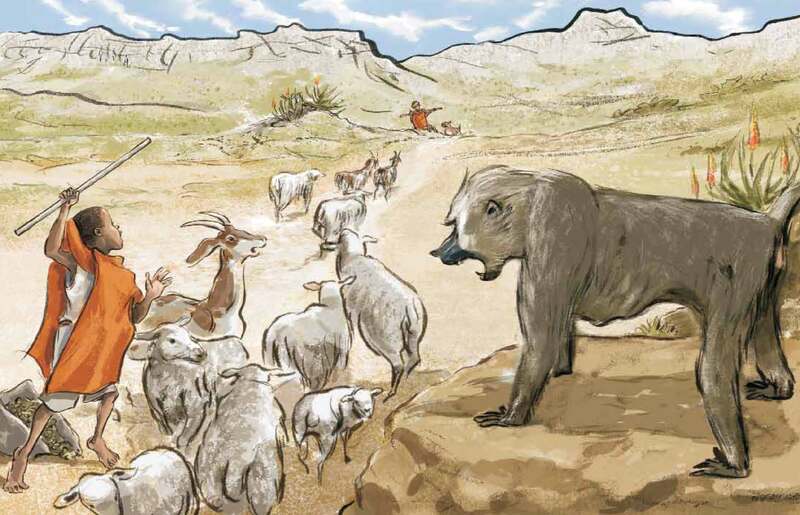 When an old baboon attacks a tiny lamb, Malusi’s courage and cool-headedness come to the surface and reveal his inner strength. At the end of his long day, walking home with the injured lamb in his arms, Malusi and Lungisa happen to cross paths on the road with a shiny new car that carries a famous former president inside. Malusi is shy about sharing his dream of becoming president with the great man — but he needn’t be. 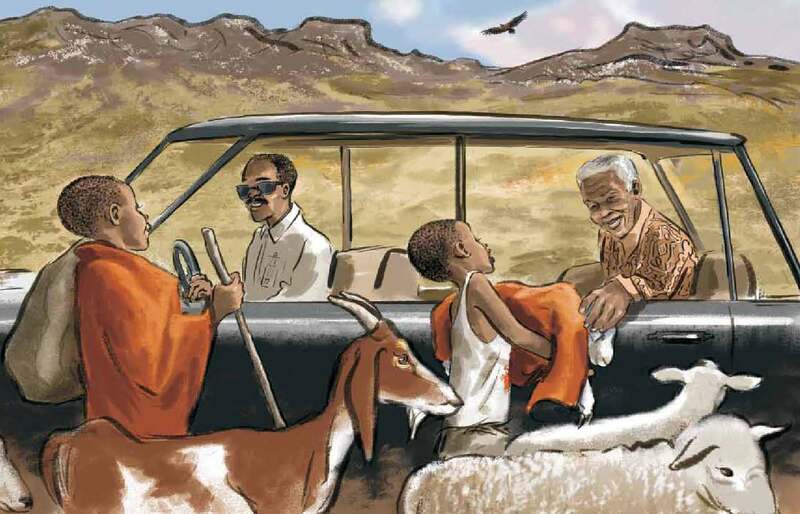 Mandela (who “also wore a red blanket and looked after sheep” when he was a boy) offers only encouragement to Malusi. “A boy who looks after his herd will make a very fine president,” he tells the boys. 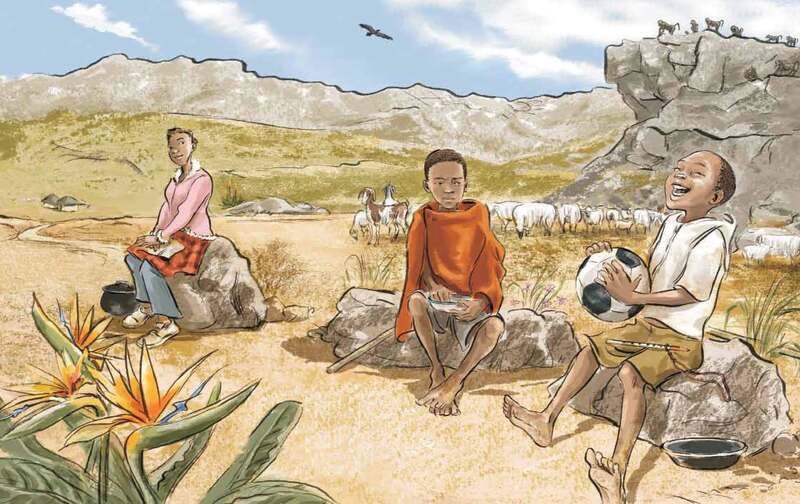 The Herd Boy allows young readers to imagine in stunning detail a very different way to experience childhood, though they’re likely to end the book feeling as they have more in common with Malusi than otherwise. It will also leave them daring — like Malusi — to believe that no dream is too big. Author/illustrator Niki Daly, who himself lives in Cape Town, South Africa, supplies a helpful author’s note at the end of the book, as well as a glossary of Xhosa, Afrikaans, Dutch, and German terms. Click to order The Herd Boy, written and illustrated by Niki Daly.